Headlines, hot news, and conversation starters on October 26, 2018! Because it's your job to take care of the bride on her special day! So what's inside the teen queen's everyday bag? The cupcake connoisseur-turned-TV host reveals the contents of her Tory Burch bag. Who: Bianca Gonzalez, TV host, model, and magazine editor. Bag: Goyard. Who: Sarah Geronimo, actress and pop star. Bag: Celine. Sarah Geronimo is Cosmo's June 2013 cover girl! What's inside her Celine bag? View the gallery to find out!Don't forget to grab a copy of your June 2013 issue-for subscription options, visit Summit Newsstand. Who: Belle Daza, model/actress. Bag: YSL Cabas. Who: Marian Rivera, actress. Bag: YSL. Who: Monika Sta. Maria, model. Bag: Steve Madden. Who: Tracy Abad, DJ. Bag: From Bangkok. 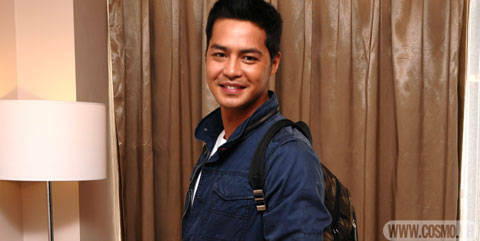 Who: Zanjoe Marudo, Actor. Where: Ace Hotel & Suites. What: Prada Knapsack. Who: Bea Alonzo, Actress. Where: Ace Hotel & Suites. Who: Laureen Uy, Blogger and Actress. Where: Rafe Totengco event at Rustan's Makati. Bag: Celine. What's in Danica Magpantay's Studded Clutch? Want to know what this statuesque beauty brings during a shoot? Launch the gallery to find out!